Epigenetic regulators (histone acetyltransferases, methyltransferases, chromatin-remodelling enzymes, etc) play a fundamental role in the control of gene expression by modifying the local state of chromatin. However, due to their recent discovery, little is yet known about their own regulation. This paper addresses this point, focusing on alternative splicing regulation, a mechanism already known to play an important role in other protein families, e.g. transcription factors, membrane receptors, etc. To this end, we compiled the data available on the presence/absence of alternative splicing for a set of 160 different epigenetic regulators, taking advantage of the relatively large amount of unexplored data on alternative splicing available in public databases. We found that 49 % (70 % in human) of these genes express more than one transcript. We then studied their alternative splicing patterns, focusing on those changes affecting the enzyme's domain composition. In general, we found that these sequence changes correspond to different mechanisms, either repressing the enzyme's function (e.g. by creating dominant-negative inhibitors of the functional isoform) or creating isoforms with new functions. We conclude that alternative splicing of epigenetic regulators can be an important tool for the function modulation of these enzymes. Considering that the latter control the transcriptional state of large sets of genes, we propose that epigenetic regulation of gene expression is itself strongly regulated by alternative splicing. Epigenetic regulation of gene expression constitutes a fundamental mechanism by which a series of chromatin modifications allow the normal functioning of the cell under different conditions [1–3]. In particular, these modifications control the repressive effect of chromatin, which limits the access of regulatory proteins to DNA, thus posing serious restraints to biological processes like replication, transcription, etc . In agreement with this, an increasingly large amount of experimental data shows the relevance of chromatin modifications in development , disease , etc. For example, recent studies indicate that histone modifications are involved in paternal X chromosome inactivation [7, 8]. Work from Roopra and colleagues  shows that histone methylation regulates the tissue-dependent silencing of neuronal genes. Also, expression of Hox transcription factors is directly related to the presence of histone marks . Chromatin modifications are produced by a series of chromatin-modifying enzymes (epigenetic regulators) that act on chromatin by either introducing histone modifications or by inducing ATP-dependent nucleosome remodelling. Histone modifications usually take place at histone tails and can introduce a wide variety of covalent marks including acetylation, methylation, phosphorylation, etc . These marks provide a simple way to access nucleosomal DNA and normally have different functional consequences [2, 11–14]. A synthetic view of the biological role of histone modifications is provided by the histone code hypothesis . According to this hypothesis, the regulatory state of a gene is a function of these modifications and their combinations. Apart from histone-modifying enzymes, enzymes that utilise ATP to modify the nucleosomal structure, altering histone-DNA interactions , also give access to nucleosomal DNA. Interestingly, both mechanisms are coordinated and cooperate to finally give access to nucleosomal DNA. For example, it has been recently shown that the SWI/SNF complex is retained to the chromatin only if SAGA or NuA4 acetylate it . As with transcription factors [17, 18], the functional activity of chromatin-modifying enzymes must be regulated in order to produce gene expression patterns that are coherent with high-level biological processes, like development or tissue differentiation. However, little is yet known about how this regulation occurs, due to the recent discovery of these enzymes [2, 3, 19]. Among the possible regulation levels , like transcription, translation or mRNA splicing, in this work we have focused on the study of the latter. We have chosen alternative splicing for four different reasons. First, because recent data [20–23] strongly suggest that alternative splicing can introduce functionally relevant changes in chromatin-modifying enzymes. Second, because alternative splicing is already known to play an important role in gene expression regulation by modulating the functional properties of transcription factors [17, 18], for example, alternative splicing can change the DNA-binding properties of transcription factors ; introduce or eliminate activating domains , increase the in vivo stability of a given isoform , etc. Third, because of the availability, in public databases, of a large amount of unexplored information on alternative splicing patterns of chromatin-modifying enzymes is available in public databases. And fourth, because the functional and regulatory impact of the most frequent alternative splicing events -in particular long sequence insertions/deletions- is relatively easier to infer, particularly if it affects known protein domains . In our work we have studied (i) whether, and to which extent, epigenetic regulators (ATP-dependent remodelling enzymes, histone acetyltransferases, deacetylases, methyltransferases, etc) have alternative splicing, and (ii) the impact of alternative splicing on the domain structure of these enzymes, with special focus on catalytic and interaction domains, which are known to play a key role [2, 3, 27, 28]. We obtained the alternative splicing data from databases with very different curation protocols, going from literature surveys, like SwissProt , to that of highly automated methods based on sequence processing and EST data, like ENSEMBL . Our results show that a substantial percentage of epigenetic regulators, 49 % (70 % for human genes), have alternative splicing. In addition, in more than 59 % of these cases alternative splicing changes affect either the catalytic or the interaction domain (Figure 1), suggesting the existence of functional regulatory effects comparable to those found in transcription factors . Alternative splicing pattern of human histone methyltransferase SUV39H2. Representation of the domain structure of three isoforms of SUV39H2, together with their sizes. Shown in red are the two domains, PRE-SET and SET that constitute the catalytic unit of the enzyme. The interaction domain, chromodomain, is shown in green. This domain is seriously damaged in the second isoform, and is unlikely to play any targeting role. The catalytic unit, on the contrary, remains intact in this second isoform, but is clearly damaged in the third isoform, with 28 % of the SET domain and the whole PRE-SET domain missing. A set of 160 genes, from different species, of chromatin-modifying enzymes was considered in this work. These enzymes cover the following activities: ATP-dependent chromatin remodelling, histone acetylation, deacetylation, methylation, demethylation, phosphorylation, ubiquitination, and sumoylation. We find (Table 1) that 49 % of the genes show alternative splicing, with an average number of 2.8 isoforms per gene. In humans, this number goes up to 70 % (with 2.8 isoforms per gene), a value close to one of the largest estimates obtained for human, e.g. 74 % . This result points to a significant role of alternative splicing in the modulation of the functional properties of chromatin-modifying enzymes. To characterise the functional variability introduced by alternative splicing in chromatin-modifying enzymes, we compared the different isoforms of the same gene at the protein sequence level, using the longest isoform as a reference. We focused our study on the changes affecting protein domains of known function, because they can be reliably interpreted in terms of biochemical/biological function . For example, it has been experimentally shown that domain changes between isoforms can be associated to isoforms with [17, 32]: a dominant-negative role, different binding affinities or new interaction partners, modified enzymatic activity, etc. In our case, we observe that 60 % (64 % for human) of the genes with alternative splicing have isoforms with at least one missing, or significantly affected, domain (Table 1). These cases can be grouped according to the functional role of the domain: (i) changes in the catalytic domains; (ii) changes in the protein interaction domains; and (iii) drastic sequence reductions. There are only four exceptions to this broad classification, corresponding to the small, single-domain, human proteins: ubiquitin-conjugating enzyme E2A (UBE2A, 154 aas), casein kinase 2, alpha 1 polypeptide (CKII, 391 aas), NAD-dependent deacetylase sirtuin-2 (SirT2, 389 aas) and aurora kinase B (AURKB, 344 aas) for which interaction and catalytic domains coincide. In these cases, alternative splicing modifications will affect both functions. We discuss below the three above-mentioned scenarios. In the human, we find several genes with isoforms that have the catalytic domain either missing or affected (Table 2). In a short isoform of the histone methyltransferase SUV39H2 (Figure 1), the catalytic unit is seriously damaged by the loss of the whole PRESET domain, and about 30 % of the SET domain. The situation seems different for chromatin remodelling SMARCA1's and kinase PRKDC's short isoforms, which only lack 11 % and 8 % of their respective catalytic domains (Table 2). However, visual inspection of the catalytic domains' structures shows that the changes are far from being structurally neutral. The deletion affecting the helicase domain DEXHC of the chromatin-remodelling enzyme SMARCA1 involves an alpha helix linking two of the most extreme strands of the central beta sheet (Figure 2A). The deletion affecting the catalytic PI3_PI4_KINASE domain of the kinase PRKDC affects a beta sheet, eliminating one strand and altering the inter-strand connectivity (Figure 2B). In both cases, the changes will produce either structural strain, or significant rearrangements, likely to result in function loss/modification. Indeed, recent experimental data for kinase PRKDC  show that the protein kinase activity of the short isoform of this enzyme is lost. Impact of alternative splicing in catalytic domains. In all cases the part of the protein affected by alternative splicing is shown in yellow, while the remaining of the protein is shown in blue. (A) Domain DEXHC of human chromatin remodelling SMARCA1. Alternative splicing results in the loss of a α-helix. (B) Domain PI3_PI4_KINASE of kinase PRKDC. Alternative splicing results in the loss of a sequence stretch that has very distant ends. The figures were obtained using the MOLSCRIPT software . Inactivation of the enzyme's catalytic function by alternative splicing is also found in one of maize methyltransferase mez2's isoforms that has completely lost its SET domain (Table 2). Two cases deserve additional comment. CARM1 (coactivator-associated arginine methyltransferase 1) has an alternative splice isoform, the catalytic domain of which, SKB1, is clearly damaged (48 % of the domain is lost). We have classed CARM1 within this section, even though an interaction domain has not yet been identified, because the full-length isoform is big enough (608 aas) to have both an interaction domain and a catalytic domain. The second case is that of RPS6KA5 (ribosomal protein S6 kinase, 90 kDa, polypeptide 5) which has two catalytic domains, but no interaction domain. In this case, lack of one of the catalytic domains may result in either an inactive or a less active protein. This situation would be equivalent to an amount regulatory mechanism similar to that described for other enzymes. In general, alternative splicing isoforms with a missing catalytic domain may behave as dominant-negative regulators of the fully functional isoform, a well-known situation in the case of transcription factors [17, 33]. This may be the case in chromatin-modifying enzymes. Indeed, a recently described PRKDC isoform with no protein kinase domain has no catalytic activity and shows slight inhibitory activity of the full-length isoform . However, the situation may be more complex, as for example the short PRKDC isoform described here is able to participate in some DNA repair processes, despite having no kinase activity . Thus we cannot rule out the possibility that, in some cases, isoforms lacking the catalytic unit may have functional roles other than being dominant-negative regulators. As for the previous case, the effect of alternative splicing can range from partial deletion to complete domain loss (Table 3). In the human, we find the latter in several genes, for example GCN5L2, MYST1 and MORF4L1. The first of them expresses two isoforms lacking the PCAF_N domain, which is involved in the interaction between the histone acetyltransferase GCN5L2 and CBP. For histone acetyltransferase MYST1, the chromodomain is lost together with a substantial part of the protein, but the catalytic domain is left intact. The case of the histone acetyltransferase MORF4L1 is somewhat surprising, as it is the short isoform that shows the chromodomain, after deletion of a sequence stretch that is in the middle of the domain's sequence in the long isoform . In other cases the impact caused by alternative splicing changes is such that, from a functional point of view, it is essentially equivalent to a domain loss. In general, a simple measure, like size, is usually enough to understand the damaging nature of the change. This is the case of human histone methyltransferase SUV39H2 that has an isoform with only 68 % of its chromodomain (Figure 1). The deleterious effect of this deletion on protein function is supported by visual inspection of the corresponding domain structure that points to a disruption of important secondary structure elements (Figure 3A). Interestingly, even small changes are likely to inactivate the domain's function. For example, chromatin remodelling SMARCA2's bromodomain only looses 14 % of its residues, but analysis of the three-dimensional structure shows that a relevant alpha helix from the helix bundle structure is lost, pointing to a disruption of such a small structure (Figure 3B). Impact of alternative splicing in interaction domains. 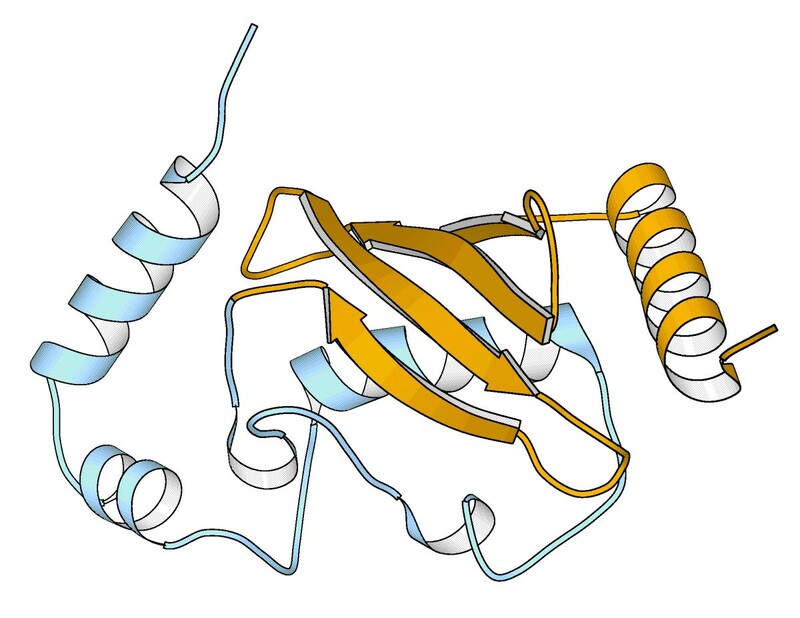 In all cases the part of the protein affected by alternative splicing is shown in yellow, while the remaining of the protein is shown in blue. (A) Chromodomain of human histone methyltransferase SUV39H2. One of the main strands of the β-sheet is missing in one of the alternative splice isoforms. (B) Bromodomain of human chromatin remodelling SMARCA2. One of the four helices of the helix bundle is lost in the alternative splice isoforms. The figures were obtained using the MOLSCRIPT software . Lack of a whole interaction domain is also found in other species, for example in the short isoform of the mouse histone acetyltransferase Htatip (Tip60), which has a missing chromodomain (Table 3). It has to be noted that in this case a significant part of the protein is also missing (the short isoform is about half the size of the long isoform). Thus, while the catalytic domain, MOZ_SAS, is preserved, it may happen that some unknown domains are also lost. Interestingly, the case of the human histone acetyltransferase MORF4L1 also appears in mouse. In all these cases the a priori functional meaning of the loss of protein interaction domains is similar and would correspond to a down-regulation of the enzyme's activity. The underlying molecular mechanisms will vary depending on the nature of the interaction lost with the missing domain. If this interaction is required for the formation of a complex between the enzyme and its partners, necessary for the catalysis, down-regulation will result from the formation of inactive complexes. This is probably the case of the short isoform of histone acetyltransferase GCN5L2. If the missing domain is responsible for substrate targeting, e.g. a chromodomain or a bromodomain, down-regulation will be a consequence of the enzyme being unable to reach its substrate. However, in this case another option is also possible, as the enzyme could be recruited to its reaction site after binding one of its complex's partners. The resulting effect on the regulation of gene expression may be substantially different in this case, as modification of the histone tail will take place. However, lack of the chromatin-binding domain will eliminate the positive feedback in chromatin signalling. The latter is mediated by specific interactions between the modified histone tails and the corresponding enzymes and leads to self-perpetuation of activating marks on chromatin. This effect has been recently proposed for enzymes carrying the bromodomain [16, 34]. Lastly, we also find instances where alternative splicing is likely to result in small modulatory changes. For example, in histone methyltransferase MLL only one of the three PHD domains is affected by alternative splicing. The small size of the change, 11 % of the domain, and the fact that the other two PHD domains remain intact, points to a modulation of the enzyme's binding properties rather than to a complete inactivation. For C.elegans's histone acetyltransferase cbp-1, the situation is similar as only one of the two copies of the protein interaction domain ZNF_TAZ is affected, by a small change that happens at a relatively neutral location (Figure 4). Impact of alternative splicing in the ZNFTAZ domain of C.elegans 's histone acetyltransferase cbp-1. 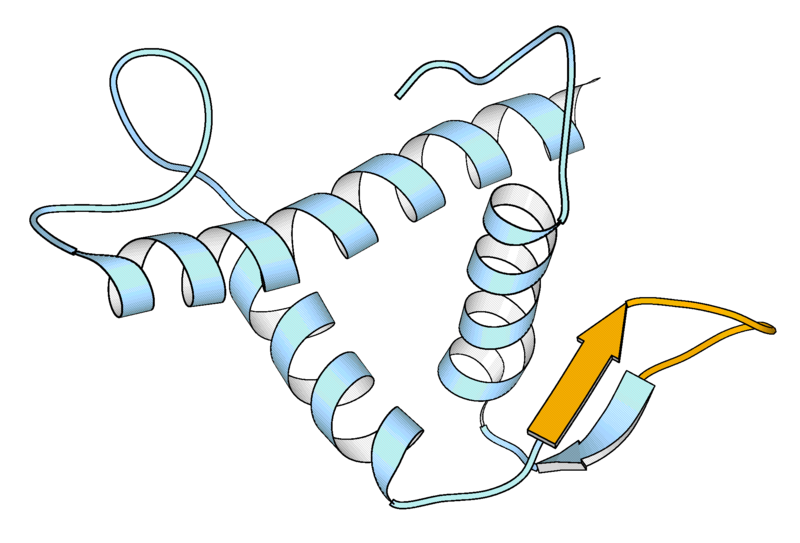 A small strand (yellow) is lost in one of the alternative splice isoform. Only small changes can be expected from this deletion. The figure was obtained using the MOLSCRIPT software . Generation of inactive isoforms constitutes a simple and powerful mechanism to regulate the amount of functional protein present in the cell [35–37]. Usually, inactive isoforms are short versions of the fully active protein in which most functional domains are missing . For several genes we find isoforms that fit this description and thus could be inactive isoforms (Table 4). In all of them the size reduction relative to the active protein is dramatic, between 35 % and 95 %, and most of the functional domains are lost or seriously damaged. For example, in the case of the human kinase ATM, the functional protein is 3056 residues long, whilst there is a short isoform associated to this gene with only 138 residues (Table 4). Catalysis-associated domains like FAT, FATC and PI3_PI4_KINASE, are missing from the short isoform, together with most of the non-annotated parts of the sequence. It is improbable that such isoform may have any functional role itself and is thus likely to be the result of the above-mentioned regulatory process. We observe a similar situation for ubiquitin-conjugating enzyme E2 A (UBE2A), which has two isoforms lacking 47 % and 22 % of the UBCC domain. The damaging effect of the missing sequence is supported by visual inspection of the corresponding domain structures (Figure 5). In the "Gene name" column we list the standard names of the proteins, although in some cases we also provide alternative names that are frequently used in the literature. In the "Species" column H.s., M.m., D.m., C.e., O.s., X.l. and Z.m. mean Homo sapiens, Mus musculus, Drosophila melanogaster, Caenorhabditis elegans, Oryza sativa, Xenopus laevis and Zea mays, respectively. The sizes of the different isoforms are given in amino acid number. *In this case, although the ANK protein interaction domain is lost, the NFSP transcription factor binding domain is retained. Alternative splicing of human ubiquitin-conjugating enzyme E2 A UBE2A. The part of the protein affected by alternative splicing is shown in yellow, and the remaining in blue. One can see that a α-helix and a whole β-sheet are lost in one of the isoforms, with a potentially very disruptive effect. The figure was obtained using the MOLSCRIPT software . It has to be noted, however, that short isoforms may not always be the consequence of a regulatory process aiming at reducing the amount of functional protein. In some genes, for example in the case ankyrin-3 , they have a specific functional role. This could also be the case for some of the transcripts mentioned in this section. Furthermore, we cannot completely discard the possibility that some of these cases correspond to database annotation errors. A common effect of alternative splicing is to produce isoforms lacking a given functional domain, pointing to an inhibitory role of the fully functional isoforms [17, 36, 39]. This correspondence between alternative splicing and protein function changes is a consequence of the modular structure of protein function, having been experimentally demonstrated in different instances . Here we show that epigenetic regulators are no exception and that their alternative splicing patterns usually involve loss of the catalytic or the binding domain, resulting in short isoforms that could easily play the above-mentioned inhibitory role. They can also be the consequence of alternative splicing-based mechanisms for the regulation of product amount. Thus, our results show how alternative splicing may regulate the functional role of chromatin-modifying enzymes. This is a first step towards the goal of understanding the biological impact of alternative splicing on epigenetic gene expression regulation. This goal, which in general is very difficult to attain , becomes particularly hard in our case, as epigenetic regulators act both at gene-specific and whole-genome levels [2, 40]. They are involved in relevant biological processes like development  or disease  and, in addition, they may also act on proteins other than histones. Nonetheless, our results clearly support the idea that alternative splicing is likely to have a substantial impact on the epigenetic regulation of large sets of genes, by regulating the activity of chromatin-modifying enzymes. One of the simplest mechanisms would be the co-expression of two alternative splice isoforms of one of these enzymes, a fully functional isoform and a dominant-negative inhibitor of the former, which may result in a reduced repression or activation of the set of genes controlled by this enzyme. To illustrate how this could happen, we can mention the case of G9a (EHMT2), a histone dimethyltransferase likely to play an important role in the repression of a large set of neuronal genes . This repression, which can affect between 30 and 800 genes, is based on a chromatin-level mechanism  (Figure 6): (i) NFSP transcription factor would recruit histone dimethyltransferase G9a to the target genes; (ii) the latter would be silenced by G9a's dymethylation of histone tails at that location. It has been observed, that dominant-negative inhibition of G9a results in abrogation of this gene silencing . In our case, we find that one of the G9a's isoforms has all the characteristics of a dominant-negative regulator (Table 2), as it has lost all its domains but the binding domain to NFSP transcription factor. We can speculate that this isoform could modulate the repression of this set of neuronal genes, in a similar way as G9a dominant-negative designed constructs  (Figure 6). Hypothetical mechanism of regulation by alternative splicing of histone dimethyltransferase G9a function. (A) Experimental evidence indicates that histone dimethyltransferase G9a plays an important role in the silencing of neuronal genes in non-neuronal tissues . In the proposed mechanism , shown here with red arrows, in non-neuronal tissues the transcription factor NFSP (shown in magenta) recruits the fully functional isoform of G9a (shown here with two domains: a binding domain in blue, and a catalytic domain in yellow) to a series of target genes that are subsequently silenced by G9a dimethylation of lysine-9 from histone H3. This mechanism may be inhibited/modulated by expression of the G9a short isoform (which only retains the NFSP transcription factor binding domain, Table 2), as shown here with green arrows. This isoform may behave as a dominant-negative inhibitor, as shown by the green arrows, blocking the access of the catalytically active isoform to the chromatin of the target gene. Absence of methylation marks in histone H3's lysine-9 would then result in an active gene. (B) The expression state of the target genes in both the nervous system (active, green colour) and in other tissues (silenced, red colour), as a result of the silencing, combined, action of NFSP and G9a. Co-expression of both the long and the short isoforms may result in the modification of the expression state of the target genes in non-neuronal tissues. These target genes may now show varying degrees of activity, as a result of the dominant-negative inhibitor role played by the short isoform (described in (A)). The list of chromatin-modifying enzymes was taken from five recent reviews on chromatin-modifying enzymes [2, 3, 19, 41, 42]. Note that DNA methyltransferases have not been considered. Subsequently we checked for the existence of alternative splicing for the corresponding genes in different databases: SwissProt , NCBI-Gene , Ensembl  and ASAP . These databases have different annotation protocols, from manual annotation in SwissProt  to highly automatic procedures in Ensembl . This allows increasing the coverage of our study. A discussion on possible error sources can be found at the end of the Materials and Methods section. As shown in Table 5, the final dataset was constituted by 78 genes with alternative splicing, together with additional information on the species, protein name and function. Due to the different procedures followed in the different databases to obtain alternative splicing information we expect a complementary coverage of the alternative splicing patterns. In the "Species" column H.s., M.m., C.e., O.s., X.l. and Z.m. mean Homo sapiens, Mus musculus, Caenorhabditis elegans, Oryza sativa, Xenopus laevis and Zea mays, respectively. In the column "Function" A, DA, DM, M, P, U and R mean Acetylation, deacetylation, demethylation, methylation, phosphorylation, ubiquitination and chromatin remodelling, respectively. In general, the gene names used follow the international standards set for each species. Standard gene names were obtained: for human from the Human Gene Nomenclature Database ; for mouse from the Mouse Genome Database (MGD) ; for D.melanogaster from the FlyBase , version FB2006_01; for C.elegans from the WormBase , release WS166; for Z.mays from MaizeGDB . The detailed exon structure of the isoforms studied in this work is provided in an additional file [see Additional file ExonStructure.xls]. As explained in the previous section, alternative splicing data are obtained from different databases and come from different sources -e.g. literature, processing of ESTs- therefore they will have a different error attached to them. Unfortunately, it is not possible to provide a reliability measure for each observation, but we can discuss the reliability of the general trends observed and how the possible sources of error affect the main conclusions of our work. First, we observe that the overall trends we find in our dataset coincide with those previously observed by other authors that have studied alternative splicing in more general sets of genes. In particular, the fact that insertions/deletions of domain size prevail in our dataset is in agreement with previous observations . Also the corresponding mechanisms for function modulation -dominant-negative inhibition, amount regulation- have been proposed and observed for other genes , although the biological context and expected impact are obviously different. Some of the very short isoforms we have obtained can be artifactual but they may also constitute a possible regulatory mechanism . In fact very short isoforms have been described for the genes in our study, e.g. for MLL . At a more detailed level, in the case of data from ASAP , the authors provide an error estimate of less than 2 % . To decrease it more, we discarded all the ASAP isoforms for a given gene, when none of them coincided with the longest isoform provided by another database. For the remaining databases the error estimates will vary, even within the database. For example, in the case of SwissProt , protein records are manually annotated, but the evidence supporting a given isoform may vary from one gene to another. Nonetheless, SwissProt  has been utilised in many bioinformatics studies on alternative splicing due to the high quality of the data [39, 54–59]. In the case of Ensembl , the predictive nature of the annotations suggests that there may be a certain amount of false positives. The latter may be more frequent in the case of very short isoforms, although it has to be mentioned that these isoforms are usually supported by a substantial amount of evidence from EST data and other databases. For all these reasons, we believe that the overall conclusions of this work will not be substantially affected by possible errors in the data. The domain structure of the different isoforms was obtained utilising CD-Search . This program identifies the functional domains present in a protein sequence. We focused our analysis on the Pfam  and Smart  domain definitions. COG (Tatusov et al., 2001) definitions were not available for all the species and for this reason they were not utilised (no significant differences were observed when utilised in this analysis). Because in some cases domain boundaries for the same domain would change slightly from one database to another, we combined the two definitions in a consensus domain definition, as follows: the location of the N-terminal domain was taken to be the minimum of the Pfam  and Smart  values; for the C-terminal end, instead of the minimum, we took the maximum of the Pfam  and Smart  values. For example, if a given domain occupies positions 3–75 and 8–82 according to the Pfam and Smart definitions, respectively, in our consensus definition it will go from position 3 to position 82. We eliminated from the domain mapping all the domains with functional annotations of no, or unclear, meaning within the context of this work, that is: microbial domains, like viral capsid domains, and Pfam B domains . In Table 6 we provide a list of the domains affected by alternative splicing mentioned in this work. Our study focused on those alternative splicing events that affect any of the known domains, as it is easier to infer their functional impact . In general, epigenetic regulators are multidomain proteins that have both catalytic and interaction domains. Because the functional role of a given isoform will depend on which of these domains has been affected by alternative splicing, we grouped the observed isoforms according to the biochemical nature of the affected domain(s): (i) alternative splicing affects the catalytic domains; (ii) alternative splicing affects the protein interaction domains; and (iii) alternative splicing affects results in drastic sequence reductions. An alternative splicing event belongs to the first class when the corresponding sequence change mainly affects the catalytic domains, but the resulting isoform retains at least one of its binding domains (i.e. keeps its binding ability). Alternative splicing events are classified in the second group when the sequence change mainly affects the interaction domains, but not the catalytic unit. Finally, alternative splicing events belong to the third class when both the catalytic and the binding domains are affected by the sequence change. Four proteins were not included in this classification, ubiquitin-conjugating enzyme E2A (UBE2A, 154 aas), casein kinase 2, alpha 1 polypeptide (CKII, 391 aas), NAD-dependent deacetylase sirtuin-2 (SirT2, 389 aas) and aurora kinase B (AURKB, 344 aas) because they only have a single domain which plays both a catalytic and a binding role and therefore large alternative splicing sequence changes are very likely to affect both functions simultaneously. Direct structural information was not available for none of the proteins considered in this work. However, in some cases the changes produced by alternative splicing embraced a part of the sequence for which structural information was available from a homolog. In these cases, this part was modelled utilising the well known, standard, modelling package MODELLER , and using the structure of the homolog as a template. The latter was obtained from the PDB database . A list of cases, together with the domains involved, the homologs utilised, and the sequence identities between the latter and our proteins, is shown in Table 7. In the "Species" column H.s. and C.e., mean Homo sapiens and Caenorhabditis elegans, respectively. The size of the whole protein is given in amino acid number. % Seq.Id. is the percentage of sequence identity between the target and the template sequences. The PDB code is the code of the template structure utilised for the comparative modelling in the PDB database . Structural models are utilised throughout the article to illustrate the location of alternative splicing changes and to help understand/infer their functional impact. The conclusions that can be drawn from the use of these models are limited by the following facts: (i) in general, epigenetic regulators are multidomain proteins, while the structures correspond to only one of these domains; (ii) the structural changes resulting from certain sequence changes may be difficult to predict. It is clear that the structural analysis would benefit from taking into account the structure of the whole protein, but this information is not yet available for the proteins in our dataset or for their homologs, neither close nor remote. This would be a serious problem if our aim were to predict with high accuracy the structural/functional changes resulting from alternative splicing. However, our goal is more coarse-grained, as what we want to see is whether alternative splicing changes result in the presence or absence of the biochemical function associated to a given domain. When the sequence change affects the whole domain, by far the most frequent situation, it is reasonable to assume that the resulting protein has lost this activity and that it may function as a regulator (e.g. a dominant-negative inhibitor) of the full-length isoform, something that has been experimentally confirmed in the case of transcription factors , among others. If the sequence change does not reach the domain size the situation is more complex, because it is more difficult to decide whether it will result in complete function loss, modulation of an original function or creation of a new function. Without further structural data we cannot provide a definite answer for none of our cases. However, in some instances the nature of the sequence change is not compatible with preservation, or smooth modulation, of the domain's function. This happens when the domain is small and the sequence change is large, or it affects the protein core or any important secondary structure element. In these cases we have proposed that the most likely effect of alternative splicing is that of a regulator of the fully functional isoforms, something that has been already observed in the case of the epigenetic regulator SMARCA1 . Finally, we cannot reject the possibility that some of the regions affected by alternative splicing may be intrinsically disordered, as has been recently proposed . However, if the sequence stretch affected by alternative splicing encompasses a whole protein domain the functional interpretation will remain the same, as it is independent of whether the domain in question is structured or disordered. If the affected stretch is of sub-domain size, the situation could be different if we knew that the domain involved is disordered. However, this is unlikely as the domains affected by alternative splicing discussed here are homologues, sometimes very close, of domains with known three-dimensional structure (Table 7). The authors are grateful to the SwissProt team for their support. XdC acknowledges funding from the Spanish government (grants BIO2003-09327, BIO2006-15557). MM-B and NB acknowledge funding from the Spanish government (grants SAF2002-00741, SAF2005-01285, Gen2003-20642, CSD2006-00049, and BFU2006-01493/BMC). NB acknowledges financial support from the Parc Científic de Barcelona. SL acknowledges financial support from the Consejo Superior de Investigaciones Científicas. SL obtained the set of manually curated data, annotated them with the alternative splicing and protein domain information. NB contributed to design the study and to its testing. MM-B and XdC conceived the study, designed most of the testing and wrote the article. All authors read and approved the final manuscript.